Colin Sinclair writes: "My aim is to help students, young Christians, and church members see how the Bible holds together. I want to take them on a journey through the Bible showing how each part contributes distinctly to the whole. I want to excite them and encourage them to explore it themselves and provide them with the necessary tools. Many people have a high view of the Bible but rarely read it or know where to start. I suggest some new angles that might give them a desire to visit even the most unpromising parts. By giving background, insights, and an overall view to each book and section, I hope people will say "Oh, I see now," and then go on and read for themselves." - Publisher The Revd Colin Sinclair is Church of Scotland Minister in City Centre Church in Edinburgh (Palmerston Place). He is chair of Scripture Union International and until recently was Chair of Council of Spring Harvest. Colin writes SU notes and speaks at many large Christian gatherings. He and Ruth have four children. 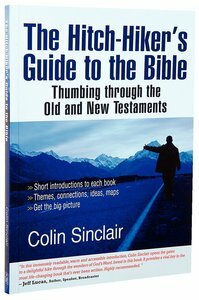 About "The Hitch-Hiker's Guide to the Bible"
The Revd Colin Sinclair is Church of Scotland Minister in City Centre Church in Edinburgh (Palmerston Place). He is chair of Scripture Union International and until recently was Chair of Council of Spring Harvest. Colin writes SU notes and speaks at many large Christian gatherings. He and Ruth have four children. Colin Sinclair is pastor of Palmerston Place in Edinburgh, UK. He is the chair of Scripture Union International and former chair of council of Spring Harvest. Colin speaks at many large Christian gatherings. He and his wife, Ruth, have four children.